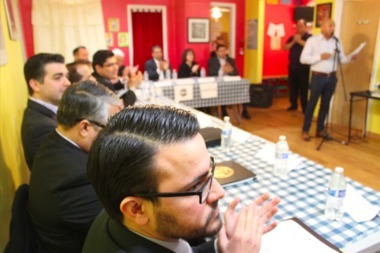 The question-and-answer session took place in Hermosa but also involved wards representing Logan Square, Humboldt Park, West Town, Belmont Cragin and Irving Park. HERMOSA — A question-and-answer session forum featuring aldermanic candidates hoping to serve the Northwest Side drew community members from Hermosa, Logan Square and Humboldt Park Monday night. Voters packed the Hermosa arts and dance studio En las Tablas Performing Arts, 4111 W. Armitage Ave., to watch all 13 candidates for wards 26, 31, 35 and 36 discuss a wide variety of neighborhood issues and answer questions. Those four wards also make up the majority of Humboldt Park and Logan Square and include 26th Ward candidates Adam Corona, Juanita Irizarry and Ald. 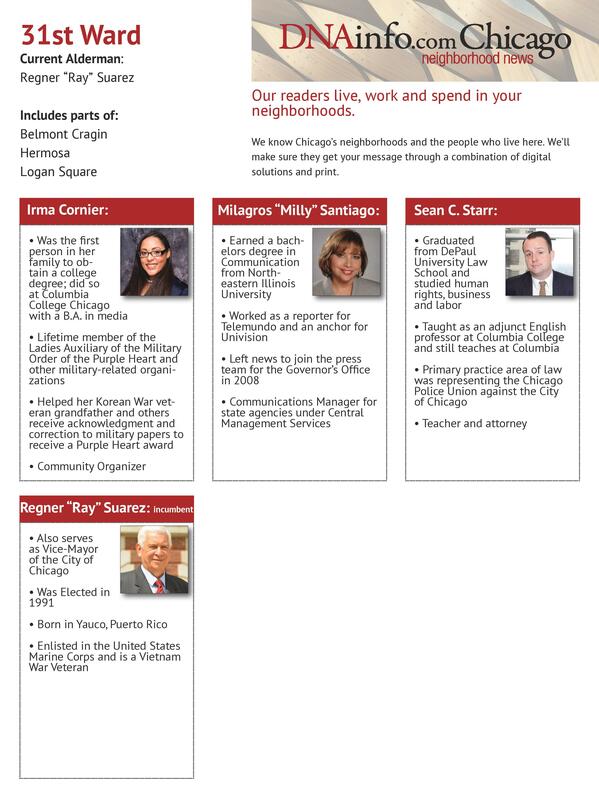 Roberto Maldonado; 31st Ward candidates Irma Cornier, Milly Santiago, Sean Starr and Ald. Ray Suarez; 35th Ward candidates Ald. 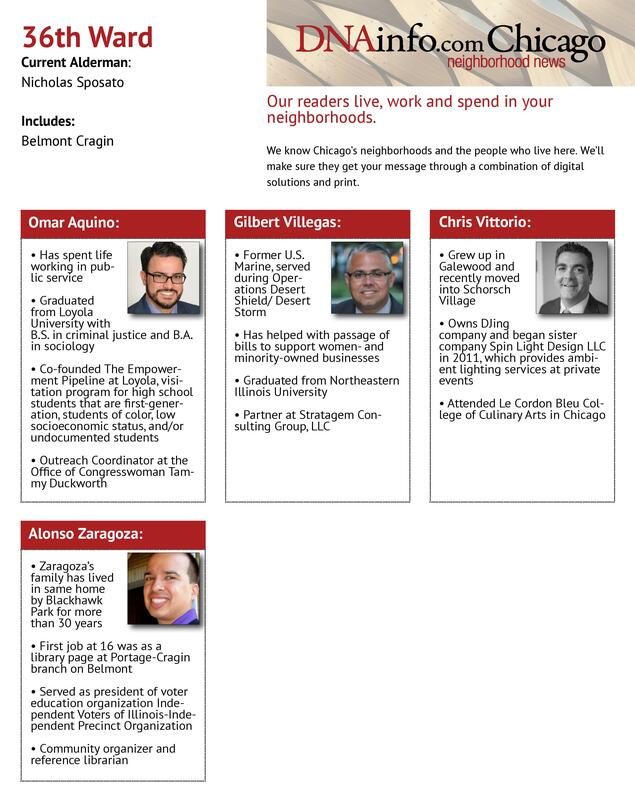 Rey Colon and Carlos Rosa and 36th Ward candidates Omar Aquino, Gilbert Villegas, Christopher Vittorio and Alonso Zaragoza. All 13 candidates from wards 26, 31, 35 and 36 are confirmed for the aldermanic discussions. Cornier, having attended the vigil for family friend and slain 13-year-old Anthony Diaz that night, arrived late to the discussion, but not before the candidates were asked eight questions touching on local economic development, affordable housing, public safety, education, gentrification and voter power dilution. Check out our comprehensive guide to the 2015 municipal election. The first question of the night went to candidates of the 26th Ward and centered on how candidates would encourage small-business growth as alderman. Corona, the 45th Ward Streets and Sanitation superintendent, said that as a small-business owner he’s against big box stores — both those already in the area and any potential ones. He suggested the use of tax increment financing and local banks to help support small business in the area. She added that helping businesses with technical and bookkeeping assistance would also be on her agenda. In answer to the same question, Ald. Maldonado said that micro-loans already available through the city could help to encourage growth and the Armitage/Milwaukee TIF district could be used to bring much-needed funding to businesses in Hermosa. All three candidates opposed raising property taxes. 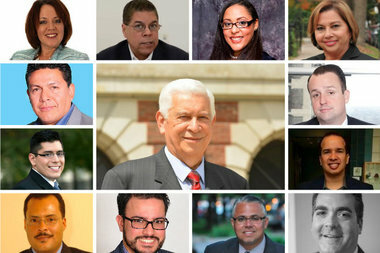 A range of alternatives were suggested, including Irizarry's idea of raising sales taxes and Corona's suggestion of welcoming casinos to the city. Hermosa resident Carmen Peralta asked how candidates of the ward would help protect tenants like herself, facing eviction with 30 days notice. “In terms of finding more affordable housing, we have to build more affordable housing,” Ald. Suarez responded. Santiago said she would defend the middle class by holding landlords accountable for their actions in the community. In a second round of questions, a Kelvyn Park High School student asked candidates how they would tackle issues of charter schools versus neighborhood schools in Hermosa and the surrounding areas. Starr, who comes from a family of public school teachers, said he supported neighborhood schools. Both Suarez and Santiago noted that Kelvyn Park and another local school, Ames Military Academy, were both locked in years of remediation before experiencing a recent turnaround. 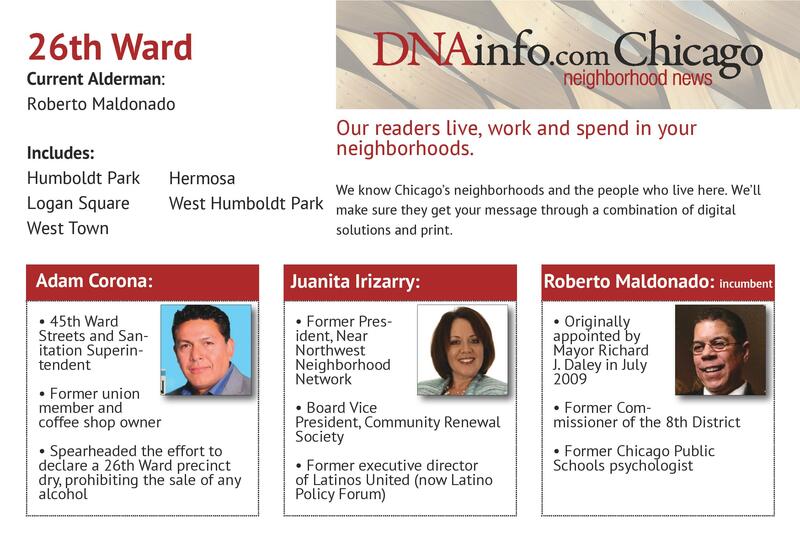 En Las Tablas owner Maritza Nazario put the third question of the night to 35th Ward candidates, asking how the winning alderman would handle communication between wards since Hermosa sits on four separate political borders. “You should be getting more services, not less,” Ald. Colon said, adding that the $1.3 million in “menu money” each alderman receives would essentially be doubled by four in the case of Hermosa, which would, ideally, have access to each menu budget. Rosa then took the opportunity to address the crowd in Spanish. “I want to make sure you don’t have an alderman who’s indoors year-round,” he said, before stating that he’d reach out to any neighboring alderman to serve the ward. 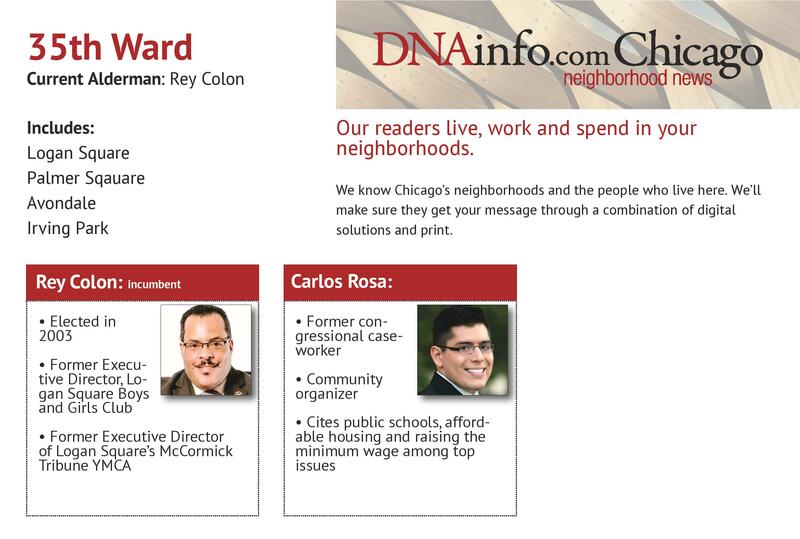 The second 35th Ward question came from 10-year Hermosa resident Fernando Fuentes and touched on improved police response in the neighborhood. Public safety has been one of the cornerstone’s of his 11 years in office, Ald. Colon said, adding that there has been a significant drop in crime during his tenure. “It’s important, as alderman, that we work with everyone to make sure they’re part of the community,” he said. Rosa briefly touched on his experience as the victim of a street attack before saying that he would work to shift police overtime pay toward increasing the presence of beat officers on the streets. He also said he want to bring participatory budgeting to the ward. A 25-year resident of the ward asked candidates of the 36th Ward how they would support arts and culture as alderman of the ward. He told a brief story of his own Chicago neighborhood park being closed in his youth before vowing to “do whatever it takes to make sure our kids have funding." “We have to realize that not all of our children are going to college,” said Villegas, before citing vocational training as a solution and stating that he’d donate a portion of his aldermanic salary to a 35th Ward scholarship foundation that he would create as alderman. Villegas also would bring participatory budgeting to the ward, he said. According to Aquino, a CPS graduate, the neighborhood needs better parks in addition to work on “intertwined” social issues like education, employment and public safety. Aquino said one of his first initiatives as alderman would be to start a community advisory council to explore how to best improve culture and youth development in the area. Vittorio, a lifelong resident of the ward, broke his answer into two priorities: mentoring and providing options to families through attracting magnet schools to the neighborhood. The event was organized by the Hermosa Community Network to hear from each candidate from the four wards that make up Hermosa — and varying parts of six other neighborhoods — before the Feb. 24 election.